Celebrate your legal right to intoxication with cocktails on tap, drinks under $6, and period attire. Indeed they are. Image via Vessel. Back in June, Washington marked the repeal of our state-run liquor business. And Thursday, December 6, large numbers of foliage fans will celebrate the legalization of marijuana. But let us not forget that the previous day, December 5, is the original Repeal Day, and still highly worthy of celebration. 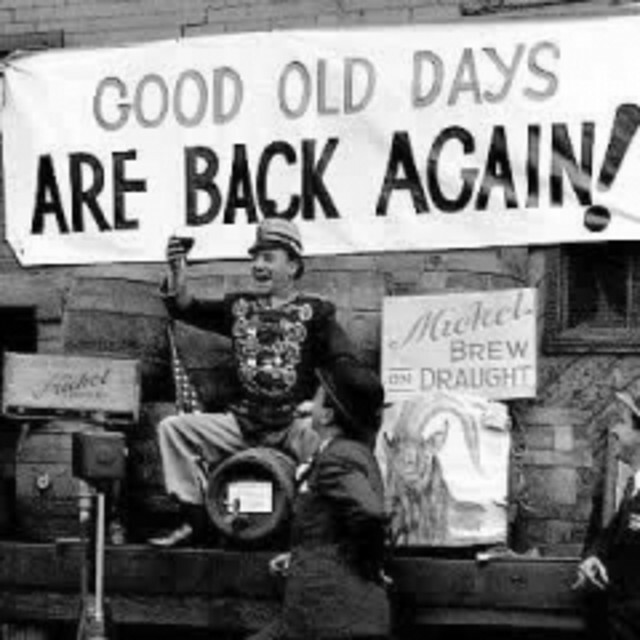 Nearly 80 years ago on this day, the 21st Amendment passed, ending the now unimaginably long 13-year dry spell that was Prohibition. Marking the occasion calls for Boardwalk Empire-style attire and a steady supply of carefully crafted drinks. Here are a few historically minded Seattle establishments that will be celebrating Repeal Day on Wednesday. Happy hour will continue as usual at this speakeasy-style spot, but everything on the menu will be $5. Moscow Mules and Mayme Taylors galore. Keith Waldbauer and Andrew Friedman's Capitol Hill bar boasts more than 85 bourbons and ryes, but the bar is partnering with Angel’s Envy bourbon for a special Repeal Day menu. No need to dress up and no splashy formal party plan. Just stop in whenever. Terra Plata manager Jody Haynes and local chef Tomer Shneor’s wandering dinner series is landing at the Fremont Abbey Arts Center, along with Charleston dance lessons, live music from the Careless Lovers, and Prohibition-inspired food and cocktails from guys like Gregg Holcomb of Knee-High Stocking Company. All proceeds go to the Fremont Abbey Arts center. Here’s a list of all participants. Tickets range from $25-50, purchasing them in advance gets you an extra $5 cocktail when you get there. Best costumes get even more food to indulge in. All ages. Repeal Day cocktails are an absurdly low $5.74 from 6 until close. Choose from the Clover Club (gin, lemon juice, egg white and raspberry syrup) or the Sazerac (rye, Peychaud’s, sugar and absinthe) to satisfy your post-Prohibition needs. Wednesday marks the debut of the bar’s first-ever dedicated cocktail tap, which will be pouring Northwest Vespers, made with gin and vodka from Batch 206, and Imbue’s bittersweet vermouth, all night. Additionally, a special Repeal Day menu is dedicated to Seattle distilleries (and distillers) such as Sound Spirits, Sun Liquor, Oola, Batch 206 and Marteau. Repeal Day at Vessel is kind of a big deal. The bar started marking the occasion in 2006, and the tradition has carried over to the new location. Don some vintage attire, be it Fred and Ginger or the flapper and gangster variety, and settle in with the night's special cocktail menu.